Mesut Ozil has thanked Arsenal fans for their support amid a continuing row with the German Football Federation (DFB) that led to the World Cup winner quitting international duty. Ozil was criticised after meeting with Turkish president Recep Tayyip Erdogan prior to the World Cup, alongside team-mate Ilkay Gundogan. After Germany's World Cup defence fell at the first hurdle, the Arsenal playmaker complained about the DFB's handling of the affair and accused the body of discrimination. Ozil suggested he was made a scapegoat due to his Turkish heritage, stating: "If we win, I'm German. If we lose, I'm an immigrant." DFB president Reinhard Grindel has rejected Ozil's accusations and said he will not be resigning from his post over the row. 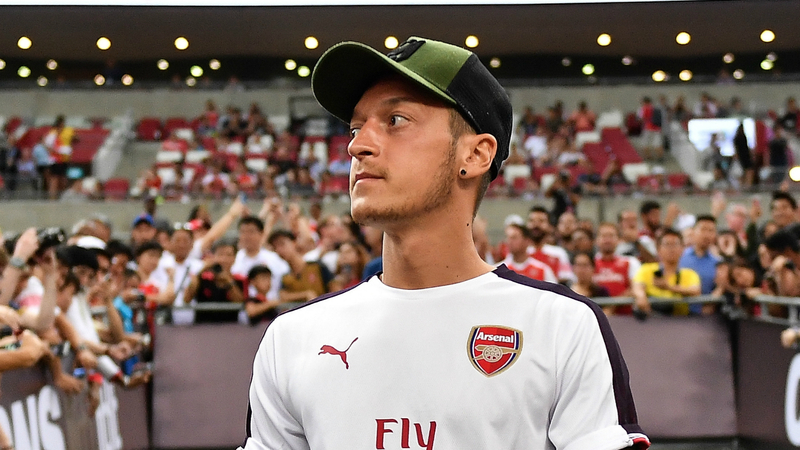 Ozil was in Singapore with Arsenal on Thursday as the Gunners continued their pre-season campaign with an International Champions Cup defeat to Atletico Madrid on penalties. And Ozil used a social media message to express his gratitude for the strong support he received from fans at the National Stadium. "Thanks to the Gunners in Singapore for showing so much love tonight," Ozil wrote with a picture of himself signing autographs for supporters.